Craft better items from items you no longer use with the Melding Pot in Monster Hunter: World. 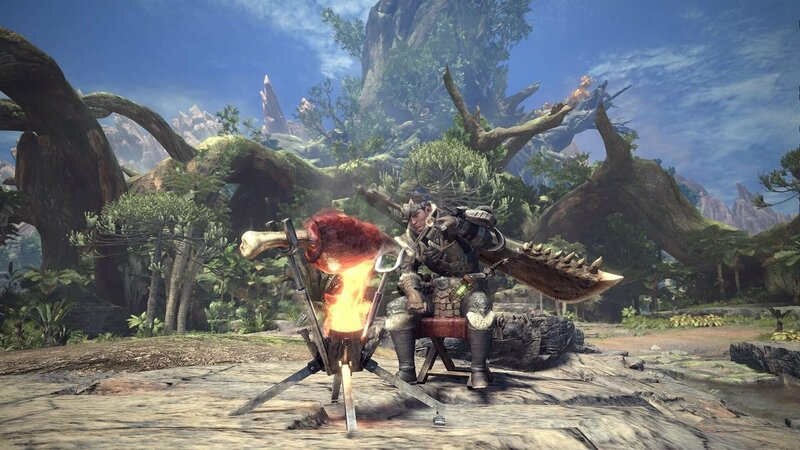 In Monster Hunter: World, players have the ability to melt items down for Melding Points using a tool called the Melding Pot. This can be extremely useful, as it’s a great way to salvage old items for newer, stronger items. Of course, you’ll first need to unlock the Melding Pot before learning how to use it in Monster Hunter: World. To help you out, we’ve put together a quick guide on how to unlock and use the Melding Pot in Monster Hunter: World! The Melding Pot can be used to break down old items and craft new items in Monster Hunter: World. Before you can learn to use the Melding Pot, you’ll first need to unlock it in Monster Hunter: World. To unlock the Melding Pot, you’ll need to run through the Coral Highlands quest line. Towards the end, you’ll be given a Wyvernian Print and access to the Melding Pot located in the center of Astera. With the Melding Pot available to you, you’ll need to begin familiarizing yourself with how it works. If you have a weapon that you no longer use, for example, you can speak with the Elder Melder and select the weapon in order to meld it. With the weapon selected, the item will be dropped into the Melding Pot, melted down, and turned into Melding Points. Melding Points can be used in conjunction with Research Points to craft (or purchase) newer, better items from the Melding Pot. To craft the Odogaron Plate, you'll need to melt items that drop the Silver Wyverian Print in Monster Hunter: World. This is pretty straightforward, although if you’re looking to craft specific items you’ll need to know the recipe, AKA which items to melt in order to get the fuel needed for that item. Avoid mindlessly melting items using the Melding Pot, as this won’t help you craft items to best suit your needs. To explain further, let’s say you want to craft the Odogaron Plate in Monster Hunter: World. You’ll first need to break down an item in the Melding Pot that rewards you with the Silver Wyverian Print. 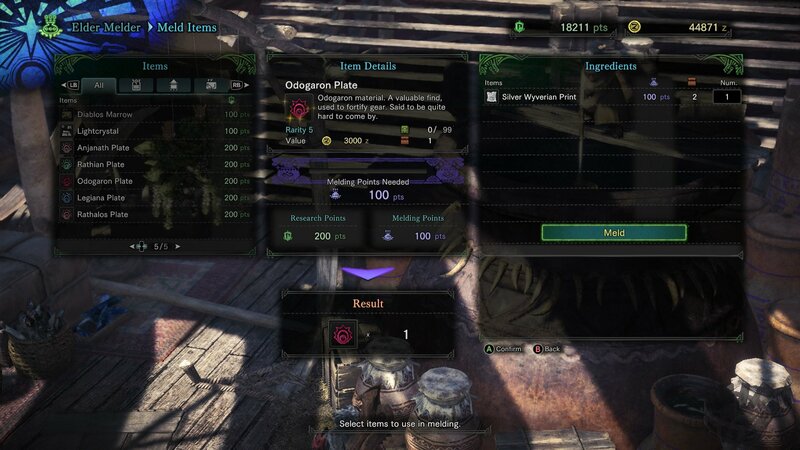 Without the Silver Wyverian Print, you cannot craft the Odogaron Plate. As such, we recommend cross-referencing the list of items that can be broken down using the Melding Pot before beginning the melding process. With a bit of trial and error, you should have no problem locating the Elder Melder in Astera, and working with him to melt your items down using the Melding Pot in Monster Hunter: World! For more on Monster Hunter: World, be sure to check out some of our previous guides including how to get Aetheryte Shards in Monster Hunter: World, how to harvest Coral Bone in Monster Hunter: World, and what the PC requirements are for Monster Hunter: World. By reading through this guide, you should now know how to use the Melding Pot in Monster Hunter: World.